The fifth round of auditions for SBS’s K-Pop Star 4 are officially underway. As this round is called the Battle Audition, contestants face off in a 1 to 1 to 1 battle representing the company they were casted. Every season of the K-Pop Star produced many brilliant talents that we now love like, Lee Hi, Park Ji-Min, Akdong Musician and many more. And this season is no different from Season 1, 2 and 3 as it is filled with dozens of amazing talents who dazzle the judges. I’m certainly sure that we will have to wait and see, as the judges will have a difficult time to choose the Top 10s this season. Below are the 3 new incredible talents (and also my favourites) whom we should be keeping our eyes on throughout the journey to become the next K-Pop Star! Lily Morrow, mostly known as Lily M. is one of the youngest contestants this season, yet is one of the most talented participant! She is a 12 year old Korean-Australian from Marysville, Australia. Every time she performs, she amazes the judges and has them falling in love with her. Judge Yang Hyun-Suk chose her as his favourite and has mentioned multiple times that he wants to properly train her at YG Entertainment. Everybody is really impressed at what she can do at such a young age, like can you imagine what she will be able to do when she’s older and rightly trained? She is definitely one of the talented singers with infinite potentials and talents and the range of possibilities of Lily M. going to the Top 10 is enormous! Jung Seung-Hwan is a contestant on K-Pop Star Season 4, who currently tops all music charts including Melon, Olleh, Genie, Bugs and many others. He stole the spotlight and became a hot issue among Koreans only hours after his performance of Kim Jo-Han’s “I Want to fall in Love” was aired on TV. Judge Yoo Hee-Yeol had said that Jung Seung-Hwan is the first male contestant who stole his heart and that he could start releasing albums now; Yoo Hee-Yeol also wanted him to sing on his music show, Yoo Hee-Yeol’s Sketchbook. The three judges and the viewers are so impressed and Jung Seung-Hwan drives anyone listening to him to happiness. Also, the judges and the audience are deeply moved and touched when he sings, as his voice is full of emotions. Keep your eyes on Jung Seung-Hwan as well, as he waits for the 2nd places rematch next week. Lee Jin-Ah is a singer who released her first album in October, 2013. She is also one of the gifted contestants this season with superb technical skills, especially her unique voice is one of her point of attraction. The way she sings with her youthful tone is her charm. She also has the ability to compose beautiful melodies, leaving the judges speechless and have the audience fascinated in her sounds and melodies every time she performs her own music. Just like Jung Seung-Hwan, she started to top various music charts just after the first episode of K-Pop Star. Judge Park Jin-Young praised her by saying, “I will stop doing music, and I want to hide somewhere right now.” The famous American pop star, Jason Mraz also raved about her performance. He said, “It was surprising as the music of Michael Franks, the world famous cross-over jazz musician. It is really a creative and fantastic music with jazz, soul and funk combined altogether.” Sit yourself down and just watch how much she is delighted when she’s singing! Good luck to all the contestants, you’re the next K-Pop Star! 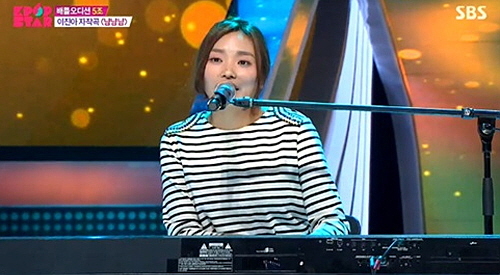 I really like Lily’s singing style and Jin -ah’s piano! Jung Seung Hwan only the best contestant…Become the winner this season..yessss!